I’ve heard a lot of talk recently about safety PLCs. When should I use a safety PLC and when should I just use individual safety controllers? Well a lot of that has to do with your particular machine that you’re trying to guard. If you have multiple zones on a machine, for example there’s 3 or 4 different doors that can be opened in order to clear a jam or maybe there’s some covers over different components that are spinning or possible pinch points, you’re typically going to protect those with some sort of safety device. Maybe it’s a safety switch or safety light curtain, each one of those are typically going to have a controller tied to it in order to monitor it and check for faults and ensure if someone opens a door or removes a cover that the machine stops in a safe manner. If you’re dealing with a large machine where there may be multiple zones or multiple covers that you want to be guarding at the same time, you might choose to shut down only part of a machine if a certain event happens. In that case you can use a safety PLC. Just like its counterpart, the regular programmable logic controller or a PLC, you can wire in various inputs which would be like safety interlock switches, safety mats, safety light curtains and actually write a program that decides how to respond when it gets an input from one of those devices. For example, you can have a guard on one end of the machine open and it shuts down just that portion of the machine while it leaves the rest of the machine free to run. Typically the breaking point is if you got more than 3 safety controllers on a given machine you probably want to start looking at a safety PLC. Very, Very, easy to implement, easy to program, and gets the job done. If you’d like to learn more about how safety PLCs could help you in your application, take a look at innovativeidm.com. We would be glad to help and remember we are Home of the Legendary Customer Experience. Hi, my name is Andy Lewis with Innovative-IDM, and today I’d like to talk to you about that dime-a-dozen controller located in your plant that is often overlooked, and generally serves its purpose day in and day out. Although they may break down occasionally, I want to make sure that you’re choosing the right temperature controller for the right application. There are four categories of temperature controllers. There’s the general purpose, the economy, a modular version and the PLC version. All of these have features, benefits and advantages. For the most part, they are all going to have a basic alarm system. Some of them are going to have a more advanced PID-Loop, ramp, soak, temperature changes. And, for the most part, whenever it comes down to the alarms that they put out or the amount of thermo-regulators that they can input within their own controller, the number increases. General purpose controllers meet a wide range of applications; generally needs for the food processing industry, packaging, extruders, semi-conductors, etc. They’re around there, they’re a dime-a-dozen, you see them all the time. Next up, is more the economy type and they are relatively simple in function. They don’t have all the bells and whistles that all the other ones are going to have. They are basically going to be able to tell you “Hey! My temperature is this, I need to be at this level, and I’m going to get to this level over this amount of time.” That’s it. Next, is a modular type, which allows you to have increased capability or decreased capability based upon changes in the application, changes in the product, etc. It all comes down to how many thermo-regulators and controllers you use in conjunction with each other. Finally, is the PLC version, which is the most advanced version and has the PID instruction in it. Basically, what it means is that it’s very advanced in the way it controls, how tightly it controls the temperature, how quickly it raises it, how quickly it lowers it, etc. That’s whenever the application has a very crucial temperature that can’t go above or below say one or two percent. I hope this set of categories for the temperature controllers helps you out. If you need any more information, please go to our Knowledge Center at innovativeidm.com and once again, my name is Andy Lewis. Remember, Innovative-IDM is Home of the Legendary Customer Experience. 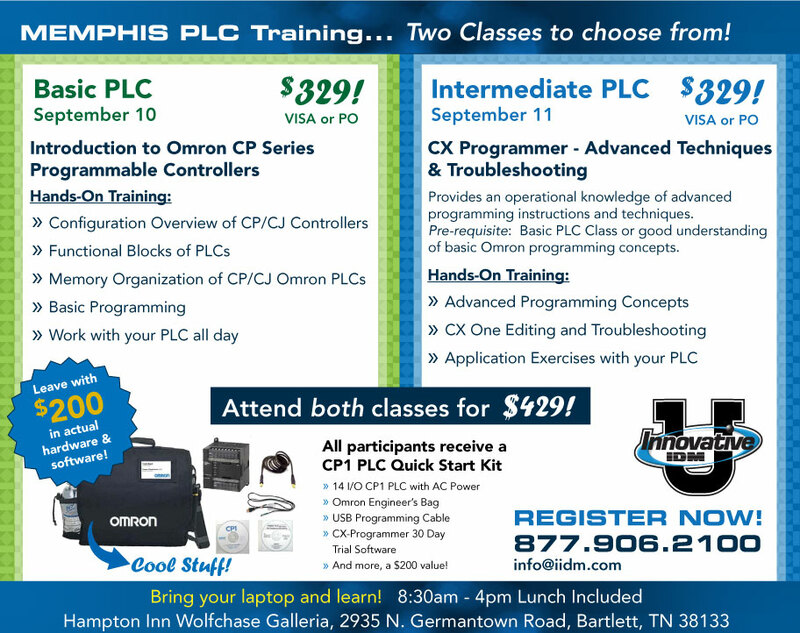 Coming to DFW on March 25 & 26 – Omron Basic and Intermediate PLC training. The PLC is one of our most popular classes of the year – these classes sold out in Houston and Tennessee earlier this year. Act now and reserve your seat today! Plus, you leave with $230 in actual hardware and software! How easy is it to sign up for DFW PLC training? Send us an email at marketing@iidm.com or call 877.906.2100 to sign up NOW. CS1D adds a number of dual-redundancy options to the well-proven CS1 architecture to ensure around-the-clock operation without minimal downtime. Duplex CPUs, with or without loop control functions, are continuously cross-checked for errors, without the need for special programs to be written by the user. An even simpler way to increase system availability is to use dual power supply units. Hot swapping of CPUs, power supplies and I/O units allow system maintenance with little or no process interruption. For more information or to order your Omron CS1D The Dual-Redundant PLC System contact Innovative-IDM.